The US based Italian singer, percussionist (and a former member of I Giullari di Piazza) presents a wonderful program of Sicilian folk songs, presented in simple and direct performances accompanied by guitarist Wilson Montuori and Sicilian percussionist Alfio Antico, who contributes percussion (tamburello and tamburo) on many tracks throughout the recording, and shares the lead vocals on one song. Musolino presents these songs with lots of energy or restrained grace, as each song demands. A number of tracks are a capella, or accompanied only by percussion, giving her a chance to show the old styles, the melodies unrestrained by the modern guitar tunings and contemporary scales, showing the old Sicilian music in much the way it might have been heard in a previous century. Michela Musolino is a singer and actress whose credits include stage, film and television. In New York City, she has performed at the Rainbow Room, Rockefeller Center, the Cathedral of Saint John the Divine as a member of I Giullari di Piazza and at Saint Mark's Church in the Bowery as a soloist in poet Paolo Valesio's, The Square of Massacred Prayers, pro-duced by Paola Bellu. She has studied Commedia dell'Arte with Enzo Aronica and Lydia Biondi as well as movement and mime with Yass Hakoshima. She has studied voice with Louisa Nadir and Southern Italian drumming with Alessandra Belloni and Roberto Raheli. 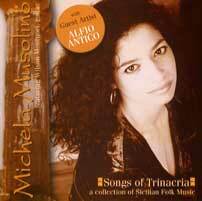 Michela has been researching and performing Sicilian folk music and is now sharing this repertoire with audiences in New York under the title Soul of the Trinacria. Wilson Montuori first began playing the acoustic guitar in Barcelona, Spain. He continued to develop his musical career in his native city of Florence, Italy, where he played with numerous bands. For the last ten years, he has been part of an acoustic duo with musician Livio Guardi and together they have toured extensively performing in Italy and the United States. After ten years of playing togeth-er, they have found a unique musical blend. The variety of instruments and their touch of Italian humor makes this duo and incredible musical journey. As Michela Musolino has been researching, singing and now recording Sicilian folk music, a performance has evolved. This recital of Sicilian folk songs called Soul of the Trinacria, includes brief explanations of the songs and also some of their history in order that audiences may be either introduced to or reacquainted with the inestimable patrimony of the Sicilian cultural inheritance. It is her belief that while folk music may have a nationalistic appeal, it is in actuality a music that belongs to the world. This is particularly true of Sicilian folk music in which can be heard the rich influence of so many cultures such as Arabic, Hellenic and Norman. By presenting a repertoire of songs ranging from lulla-bies to work chants and lively popular tunes, she tries to return to the listeners a history which has long been forgotten.